Have you ever gone to a Mexican fast food chain and ordered a burrito the size of Shaq’s size 22 foot? You know the kind I’m talking about? A big flour tortilla filled with meat, beans, rice, corn, guac, sour cream and cheese only to leave with your stomach pressing out against your pants in expansive rebellion? It happens but there’s another way to enjoy Mexican food and make progress towards your nutrition goals, whatever they might be. I love Mexican spices and flavors, so I incorporate them into my meals as much as possible using nutritious foods. 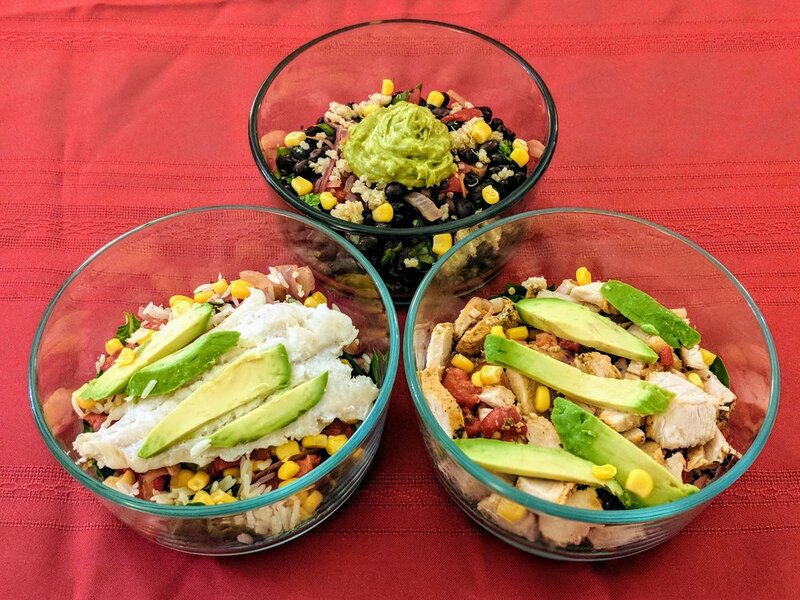 So much so that I created a template for making Mexican meal prep lunch bowls in bulk for the week; similar to a burrito bowl from a Mexican chain restaurant. You can use this template not only to make your own burrito bowls but to make nutritious decisions at a Mexican restaurant. The number of servings of each category below will depend on your activity level, body and goals. In general, if your goal is to lose body fat or you’re a smaller person, start by including 1 serving of each category except for the veggies. In fact, add as many of those as you’d like! Slowly savor and enjoy. If you don’t feel satisfied after twenty minutes, try adding an additional serving of veggies then protein after that if the extra veggies don’t cut it. If your goal is to put on mass, fuel your sports performance, or you are a larger person, try starting with 2 servings of protein, 1+ servings of veggies and 1-2 servings of fats and carbs. Lean protein: Lean ground beef/bison/turkey, fish, shrimp or shredded chicken. Beans count here if you’re a vegetarian. Vegetables: Stir fried peppers and onions, spinach, cilantro, lettuce, tomatoes or pico de gallo. Carbs: Beans, quinoa, rice, quinoa or roasted corn. Fats: Guacamole, avocado slices, sour cream or cheese. Spices: Use whatever spices you enjoy or add taco seasoning packets to the protein source after it’s cooked. Fresh chopped cilantro also pairs well and can be mixed into the carb sources. Choose your options from each category and prepare to your preferences. Try cooking in bulk to have additional meals at the ready. To save time cooking, roasted red peppers can be bought at the grocery store prepared in glass jars. 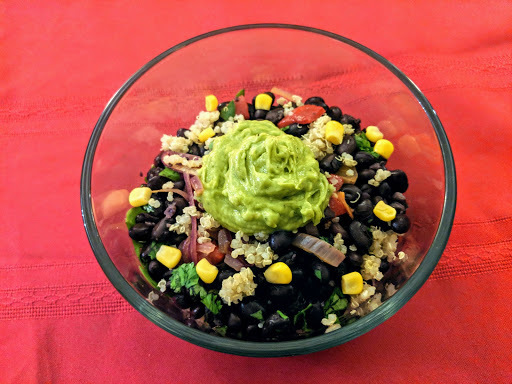 You can also buy frozen pepper and onion mixes, frozen but cooked brown rice, canned beans and pre-made pico de gallo or guacamole. Store each ingredient separately in Tupperware so that you can keep them fresh and mix up your meals during the week. Maybe one day you eat a burrito bowl, another day you add the contents to a lettuce leaf as a wrap and a third day you make a taco salad. For even more variety, try cooking two separate protein sources and varying them during the week.